To help ensure standardization, the EPA has requested that manufacturers include a pesticide’s MOA group number in a standard format on the label. Outside of the U.S., letters are used in place of group numbers (see Herbicide Resistance Action Committee website below). Herbicides with the same mechanisms of action are assigned the same group number. When a premix label displays the group number(s), the user can easily determine the mechanisms of action included in the premix. If a label does not contain a MOA group number, you should find it in this table from the North Carolina Agricultural Chemicals Manual by referencing the herbicide brand or common name. In addition to considering MOA group numbers in the selection of herbicides, review all resistance management recommendations printed on the herbicide label. This may include information on the best management practices for a particular product, target species of most concern and the maximum number of consecutive applications that should be made before rotating to products containing herbicides with different group numbers. Weed scientists from various herbicide manufacturers have formed the Herbicide Resistance Action Committee (HRAC) to develop uniform resistance management guidelines that can be implemented across geographic regions and across groups of products. Visit HRAC’s website and their Global Herbicide Classification Tool. 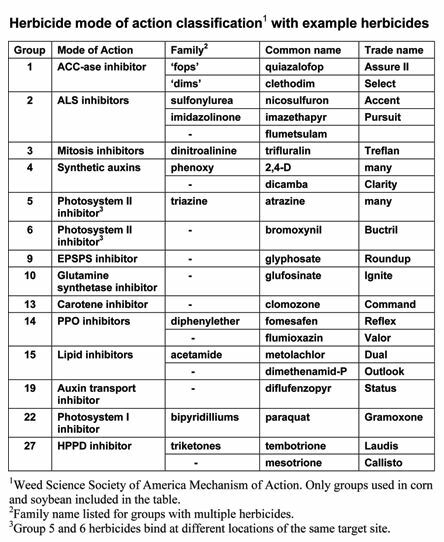 The Weed Science Society of America has a Classification of Herbicide Mechanism of Action (look under “List of Herbicides”) that differs slightly from the HRAC Classification of Herbicide Mechanism of Action. This factsheet has the designations for both classifications. The capitalized letter in the colored boxes represents the HRAC classification and the number superscripted in parentheses represents the WSSA classification (group number). HRAC’s Herbicide Classification table (link above) also indicates the WSSA designation.